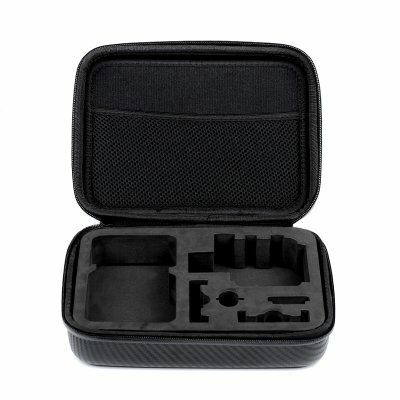 Successfully Added Portable Storage Case for Action Camera - Shockproof, Weatherproof, Supports GoPro HD Hero 4, 3+, 3, 2, JCAM SJ400 Small to your Shopping Cart. Keep your action camera protected at all times with the handy portable shockproof and waterproof case. Compatible with GoPro HD Hero 4/3+/3/2, as well as JCAM SJ400, it will protect your camera from splashes and drops. Your GoPro is meant to handle a lot. However, damage can happen when you least expect it – when your camera is not in use. Make sure your action cam is always in the best shape. It’s really easy. All you need is a reliable and sturdy case to protect it from occasional scratches and bruises. This action camera case is not only super easy to carry around, but also comes with great protection features for your camera. It’s the perfect way to take your GoPro along when traveling without worrying about it being knocked about in your suitcase or backpack. Sleek, lightweight, padded and compact, it provides the best protection for your GoPro (or other similar action camera), when it’s not in use. The case is made in such a way that allows you to conveniently store your action cam, even if it has its waterproof case on. What’s more, made from high-quality weatherproof fabric, the case is resistant to splashes or unfortunate weather changes. Thanks to the padded design, the compact case will give your camera reliable damage protection in case of an accidental drop and will keep it safe through even the toughest journey. The Portable Action Camera Case for GoPro is brought to you by the leader in electronic devices as well as wholesale Action Camera cases, Chinavasion..